We are looking forward to another great Cooper River Bridge Run! 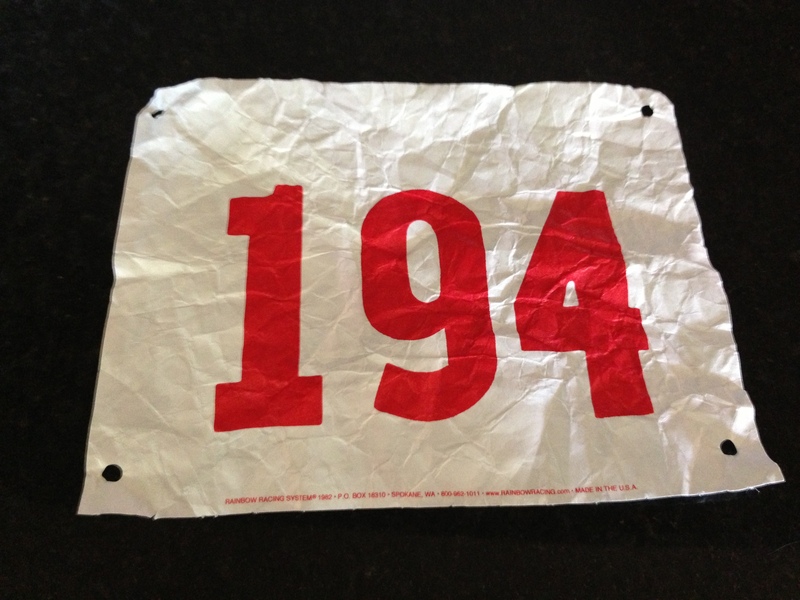 Your bib number is 646. Please be sure to print this email and bring it with you to the expo. This will save you a lot of time and effort if you have this with you when you come to the expo. If you have any questions please go to http://www.bridgerun.com. Looks like we are just about ready to fly out East next week and see how close we are to being completely dialed-in and ready to race hard at the Cooper River Bridge Run. This will be my second time running the event – and oddly enough, the second time running it coming off of injury. The truly ironic part is that these are the only two injuries I have had since 2006. Timing is everything they say in life and footraces. The last couple of weeks I have seen some good signs when it comes to our running. Last weekend’s 18:23 and top 3 finish at a small local race notwithstanding – I was happy to be able to bounce back and run a solid 12-miler less than 24 hours later. This week we went back-to-back-to-back with runs of 9, 6 and 9 miles with a few quality sub 7:00 minute efforts sprinkled here and there. I’m noticing the tone coming back in my quadriceps and the strength in my core. We have also made it back to our most effective race weight of 136.5 lbs. In a longer event like the marathon I like to race a little heavier at 138-138.5 lbs. I have been down as low as 134.5 for summer 5K’s – but that has made me feel just a little bit lacking in the power department on climbs. But 136.5 is where we have put together some of our top efforts. Shamrock half-marathon, IBM uptown Classic, Shiner Half-Marathon, Lights of Love, Turkey Trot all PR races and all at our target race weight. 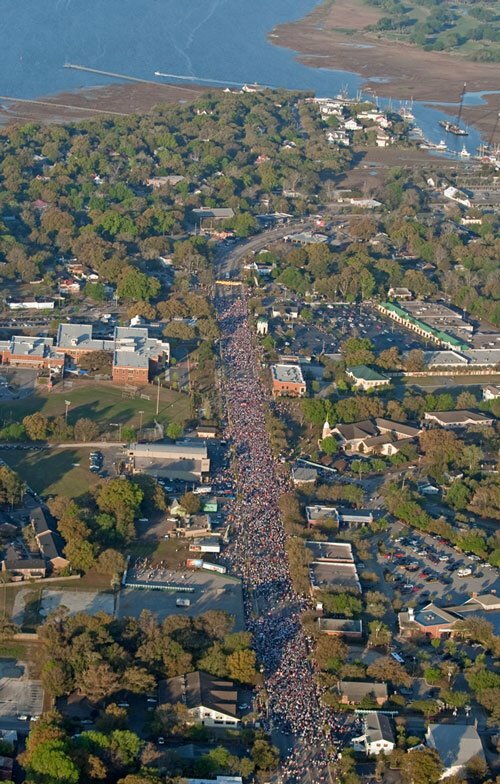 The race itself in Charleston is not one where people go to set a PR. The course in a word is brutal. Two miles flat, two miles across the Ravenel Bridge, then another 2 miles to close things out after some max effort climbing and a steep descent. In addition to the course, there is a good chance that wind is going to be a factor being so high up above the Cooper River. Lastly, being a 40,000 person point to point race – you have to deal with all of the same challenges that a large marathon would pose. An early wake-up. Commute to the finish area. Park, walk to the school busses that will transport runners from downtown Charleston to Mt. Pleasant. Once there, a long walk to the starting corrals, where runners will try to stay warmed-up, stretched, loose and ready to come blazing out onto the course. Thankfully the 10K gives you a little bit more time to “settle in” than a 5K footrace affords. 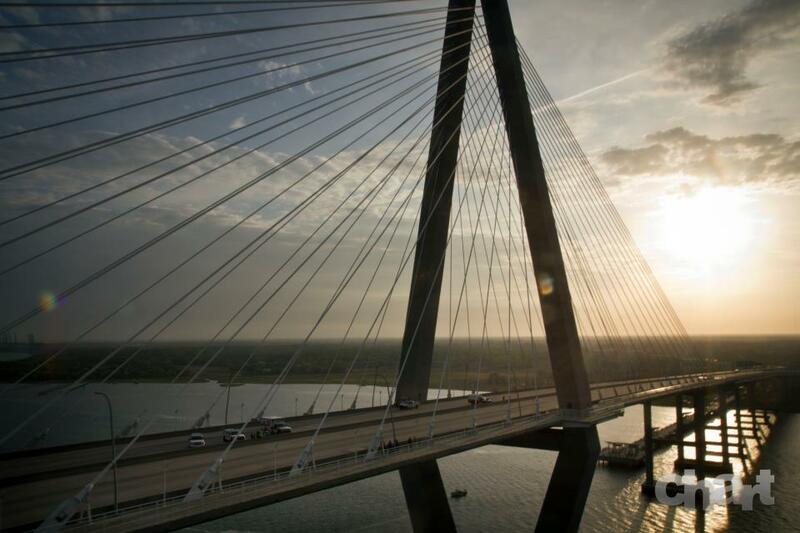 But the truth is, you need to be locked into very near goal pace over the first mile in Charleston, as you have to take advantage of the flat miles before you reach the foot of the bridge. The climb is something – well over a mile in length, with no pauses or breaks to reload. The descent drops runners from the same height obviously, but at a much steeper grade – so as much as you would like to come flying down the other side, you have to be a bit more measured and careful as you will still have a full 2 miles to race once you come off of the bridge. Like I said. Brutal. So success on Saturday is not going to be chasing our 10K PR of 37:30. That is a fool’s errand. Even on my fittest of fit days, there is no chance of running that time on that course. Instead, we are looking for a top 25 AG Finish. 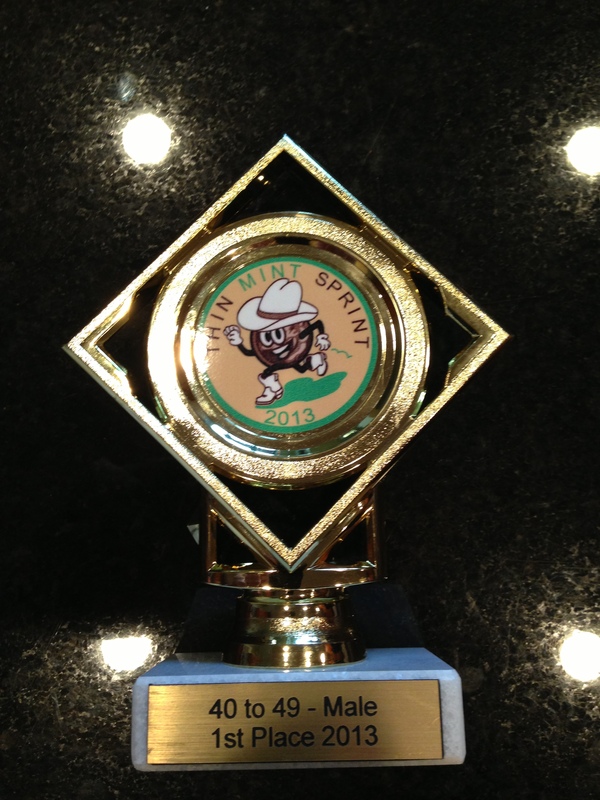 5% of Age Group Finishers are eligible for awards up to 25. At the end of the day, I hope to be in the money. Something around 39:30 should put us in the top 10-15 among male 45-49 year old finishers. Sub 40 minutes would be a completely acceptable fall-back position if the wind, course or temperature throw us a bit of a curve on race morning. Those conditions however will affect everyone equally – so again, age grouping is the goal going into Saturday. This weekend we will run 8 miles on Saturday and somewhere around 12 or 13 on Sunday – then two short runs on Tuesday and Wednesday of next week before flying out to Charleston on Thursday, complete rest on Friday and we should be as ready as we are going to be come Saturday morning. Another good test in front of us, then another back to back weeks of racing April 21 and 28 will place us in a pretty good position heading into May. Training for Steamtown will begin in earnest on June 9th. 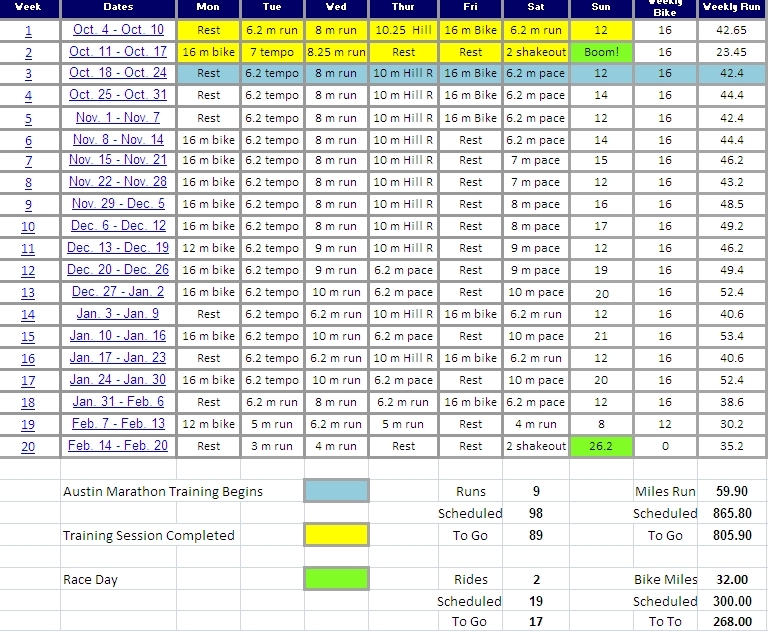 By then our long runs will be back in the 15-16 mile range on Sundays and we should be back to where our fitness level and training volume was prior to starting our Houston Marathon Cycle was last fall. A lot of work remains just to get back to where we once were – but that is the nature of the sport. You are either getting better or getting worse, nobody ever stays the same. Here’s to another step in the right direction next weekend. Bring it on Charleston. Everyone has been there. Runners and non-runners, the feeling doesn’t discriminate. Missed opportunities. Narrow defeats. Having something that you desperately want and have worked hard for, but for whatever reason it slips through your fingers. Of course you then sit back and analyze things. Over analyze them actually, trying to pinpoint the one moment where if you had just done something a little bit differently the outcome would have been everything that you hoped for. It can drive you crazy. It is also a colossal waste of time and energy. Yet we all fall prey to it from time to time. Ever since I sent in my deferment notice to the Houston Marathon back in December when I knew that my Achilles tendon strain was serious enough to keep us from racing I have been in that place. Oddly enough, my thoughts have not focused on Houston. They instead have gone back to the two marathons before. In New York through 22 miles I executed a perfect marathon. I just did not have the talent, ability, desire and training to overcome the final bridges and hills to hold pace and my dreams of a sub 3 hour marathon slipped through my fingers. At the time of course I was thrilled with my PR, happy that I was able to go toe to toe with a difficult marathon course on a huge stage and bring my “A” game. Execute my race plan and gain valuable race experience. I would get it the next time. Surely Boston would be different. At Boston last spring, just a little more than a year ago, my race like everyone else’s was over before it really started. 88 degree temperatures, the second hottest Boston Marathon in 116 years of the event made racing that day a fool’s errand. For someone hoping to run to the closest margin of their potential – it just wasn’t the day for glory. Never mind I thought. We’ll reload and be ready for Houston. We all know how that turned out. So here we are now going on 16 months since New York City and I haven’t been able to toe the line of a marathon with that same confidence. That same drive and determination to excel and the same opportunity to hold fate in my own hands and go toe to toe with one of the most difficult foot races on the planet. As much as I wanted to take the rest of 2013 off from the marathon, as much as I told myself that it was time for a much-needed break from the event, I have been uncomfortable with that decision. Can I really afford to take 12 months off at this point before I take another crack at that 2:59 knowing that I am every bit of 45 years, 7 months and 23 days old? I may be in great shape for an “old guy”, but as 3 hour marathoners go, I’m pretty darn close to dinosaur status. After Saturday’s showing at the Thin Mint Sprint, where I ran within :20 or so of my PR at that distance I strapped on my running shoes on Sunday morning and ticked off a dozen miles on tired legs at just a hair over 7:00 minute miles. 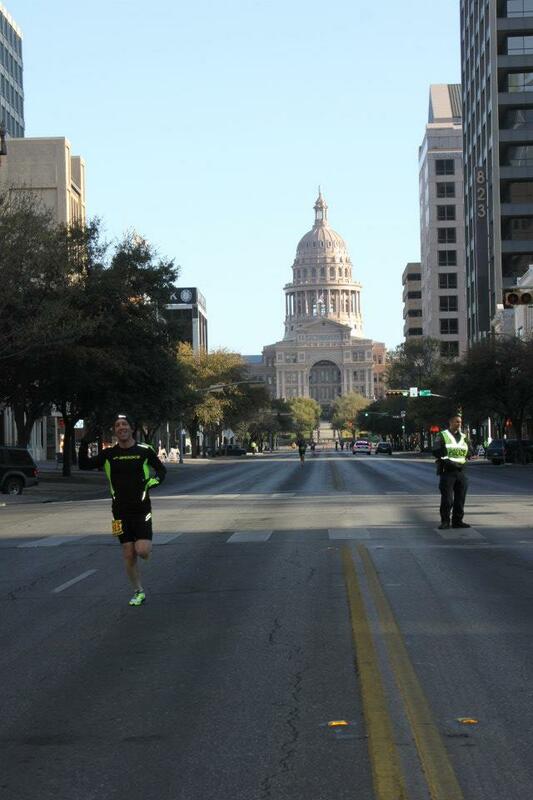 I did so over the hill course with 25 mile an hour winds blowing through Austin. It was the first time that I felt like I was really close to being back to where I was before that misstep down in Shiner, TX and our injury. I also knew that it was time to find a Fall Marathon that would give us the best chance at running, “our time“. After balancing our personal life and work life calendars – there were very few weekends that lined up well for a Fall Marathon. Knowing full well that for me to have a legitimate shot at going sub 3 I need to have a few factors going in my favor. A small Race, nothing more than 5,000 runners to navigate. A neutral to “fast” course. My window for racing would be October, and specifically the middle two weeks of the month staying away from a conference Dawn will be attending out in Florida the first week of October and being home for all of the Halloween festivities with Landry. All of those variables narrowed the list to one race and one opportunity. A race capped at 3,000 marathoners on a point to point, net downhill course that will wind up less than 2 hours away from where I took my first steps as a boy in suburban Philadelphia. Although running downhill is not all that it is cracked up to be, fatiguing those quad muscles in a big way – we’ve been there before. We had our first Boston Marathon come undone due to a similar downhill start to that race in 2010. We know how to prepare for the downs. Yes there are 3 miles of climbing at the end of the race. But again, if our training is sound and we put in the appropriate level of hill work going in, this is something we know how to be ready for. All in all, Steamtown offers us a lot of things on our wish list in looking for a Fall Race. There are some drawbacks as well, like logging all of our 18, 20, 21, 22 and 23 mile long runs in the hottest months of our Texas Summer. An experience that the last time we did this prepping for New York I uttered the foolish phrase “Never Again”. The reality of course was that running through that heat and humidity made us the strongest marathoner we had ever been on race day in New York, springboarding us to new PR’s after New York in every distance from the 5K to the half-marathon. It will certainly pay huge dividends this year as well. So here we are, ready to tee this thing up one more time and give it all we have to prepare for the most difficult but exceptional 179 minutes of racing we have ever done. Having running taken away from us for those 5 weeks has left a determined marathoner even more so in its wake. On Monday morning when registration opens we will be among the first people to log on and cast our lot. There will be 193 days to go until race day at that point. Just over 6 months of sword sharpening and we are going to pour every ounce into this training plan to be more than ready to do battle on race day. The first major race we ever ran was in the state of Pennsylvania, the day we became a Marathoner for the first time. We returned to Pennsylvania a little over 18 months later and teed it up again. That day we became a Boston Qualifier. There is only one more club we want to join when it comes to the marathon. It is only fitting that Pennsylvania again plays a prominent role. The visuals are starting to form in my mind already, coming off that final hill with 2/10 of a mile to go straight downhill to the finish. Quads screaming, feet hurting with every stride, knowing that in just under 90 seconds it will all be over. I’m not sure how this story is going to end right now – but that is what this has always been about, the journey, not the destination. Steamtown, October 13, 2013. Going to be quite a day. Boom goes the dynamite. Hi guys! Checking in from “race week” as we are starting to get that eye of the tiger going for Saturday’s 5K. Training has been a little challenging with Momma Bear in Barcelona this week, and Landry and I holding down the fort together – but so far we are both still alive, eating three times a day, grooming ourselves and haven’t missed work or school yet – so I’m counting that as a win. I wanted to share an interview that I took part of this past week here in Austin talking about Back on My Feet and our upcoming 24-hour race May 11th and 12th. B-DOE from 93.7 FM here in Austin has a tremendous program called local insights, where he focuses on one of the wonderful non-profit organizations that help make our city such a wonderful place to live. I was fortunate enough to be able to drop by the studio and speak to B-DOE about our organization and talk running, racing and a little bit about paying it forward. I hope you enjoy listening as much as we did putting it together. Tuesday marked my first day of running “doubles” in 2013. A 6 mile off/on workout in the morning, followed by a moderate 6 miles 12 hours later. I bounced out of bed Tuesday morning feeling the best I have in quite some time. After feeling no ill-effects from the Texas Independence Day 5k, my legs had started to bounce back from my runs closer to normal and there was still no pain or stiffness in the dreaded Achilles. It was time to move on, stop thinking of myself as a runner coming back from injury, and just thinking of myself as a runner who was training for a race. It seems like the physical piece always comes back before the mental one does. Tuesday was a big day and I knew it. Funny how I was the only one at 4:45 a.m. in Avery Ranch who thought so – but that is why running is such a great metaphor for life – sure you can run with friends or with a running club, but most of the time the big gains are made on some unlit trail or street in the wee hours with nobody watching except for your conscience. The first workout is an easy one to follow. The first mile is a warm up or “Off” mile, with the second mile one approaching 5K effort or “On” mile. Repeat the process Off, On, Off, On, Off, On until reaching 6 total miles. To make the workout a bit more challenging run each mile whether it is Off or On a bit faster than the last mile of its type. Not the fastest I have ever run this workout, but it was a rock-solid effort dropping pace by just about :06 per mile regardless of whether we were talking about the “Offs” or the “Ons”. The whole point of the workout is to help you run race-pace miles in a controlled environment. With the alternating easy miles or recovery miles thrown in, you can get right back to training the following day, or in my case only 12 hours later – without the fear of aggravating something or winding up injured. Key concerns for Masters ( Over 40 years old) runners. For the afternoon workout I decided to keep it short in distance and just roll up and down over the hill route for 6 miles. In a few weeks these workouts will stretch out to 8 miles each and turn Tuesday into a 16-mile day. With the temperature now 75 degrees the p.m. run was a solid progression in: 7:30, 7:22, 7:21, 7:16, 7:13, 7:00. Nothing glamorous, nothing overly impressive – just a solid training day. The kind of day that makes all the difference come race day. The next week is going to prove to be a bit challenging with Momma Bear traveling to Spain for a week. 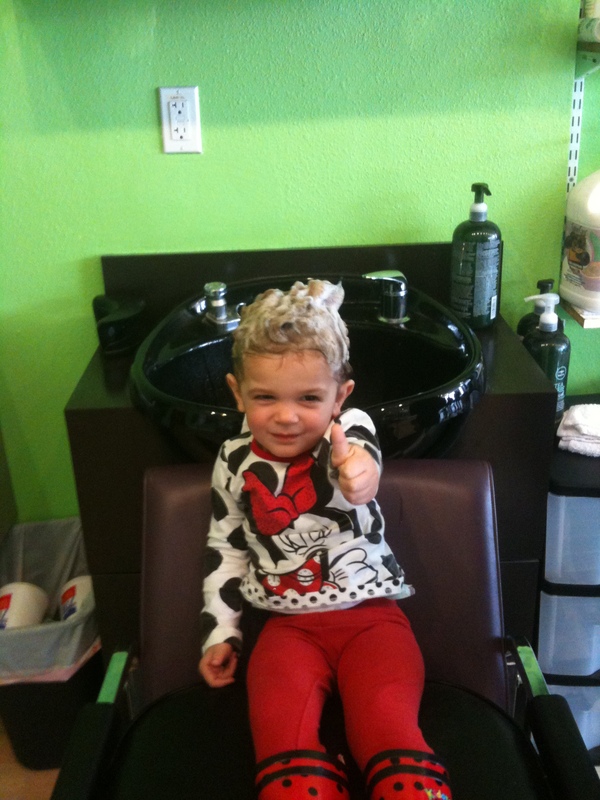 Landry will be “helping Dad train” this weekend as she puts it. I’m not sure how long she will be content riding in the jogging stroller, but we’re going to give it a shot. It might mean some early mornings or late nights on the TRI bike trainer in the garage with the baby monitor next to me – but we’ll consider those workouts mental toughness training for half-ironman at the end of our race season.